Whether your travel is for personal or professional reasons, you stand to gain by pairing your plane ticket with a fast, Internet reservation for LaGuardia Airport limo service and LGA Airport Limousine Service. Your traveling intentions will be encouraged with a focus on punctuality, access, and end results. We, LaGuardia Airport Limo Services offer a superior transportation service that facilitates all professional or personal airport related transportation. If waiting around, wasting time is the antithesis of your ideal travel scenario, consider arriving to or leaving LaGuardia Airport via limousine. For professionals with a corporate focus, you must protect your schedule and the impressions that your arrival makes. For others who travel for personal reasons, you’ll also want to maximize these precious moments spent on personal business. Book a service with us, and you’ll find that your arrival is timely, your plans facilitated, and the conveyance is impressive. We have a pool of drivers who are thoroughly vetted and professional. With a familiarity of the city’s roadways and best routes to the airport as well as a current GPS system in all fleet members, our Laguardia Airport Limo drivers can accommodate busy schedules, important flights, and any other transportation need. 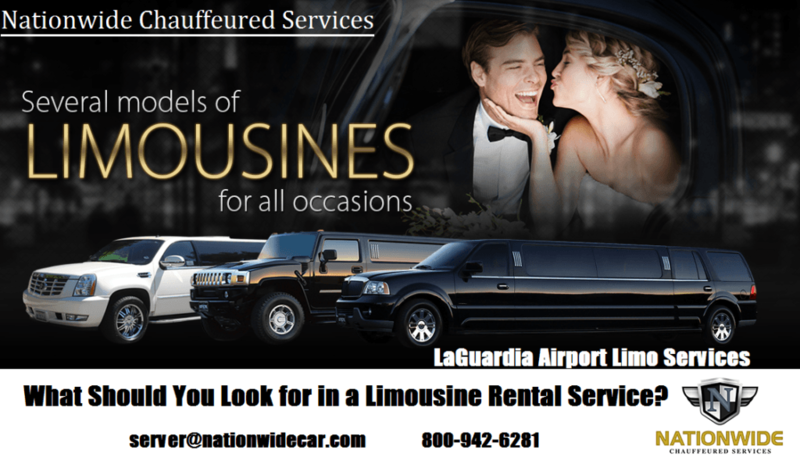 We, LaGuardia Airport Limousine have a vast familiarity with all sorts of schedules and numbers of riders, so you can rely on us to meet your needs as expected. No matter where you need to go or do, we can easily provide the needed transport. By providing transport in all major cities within the continental U.S., we can provide travel for each leg of the journey. Pair your flight with a LaGuardia Airport limo, and the experience will be straightforward, efficient, and relaxing. Further, we can easily conduct business associates, large groups, and even attendees of formal events like weddings or prom. Bookings are simple to make on the Internet or via traditional means, and we welcome availability requests with little prior notice. Make your reservation for a limo to LaGuardia Airport. And you’ll receive superior curb to curb transport with immediate billing upon your booking. When your plans change, your service can change as well. Avoid transportation companies that avoid flexible arrangements. We, LGA Car Service provide easy and fast modifications when needed, and our 24/7 customer service team is inherently flexible and accommodating. Rather than search and worry about making the best choice of transportation company; choose us.